Open daily at 11 a.m. Closing time varies with demand. 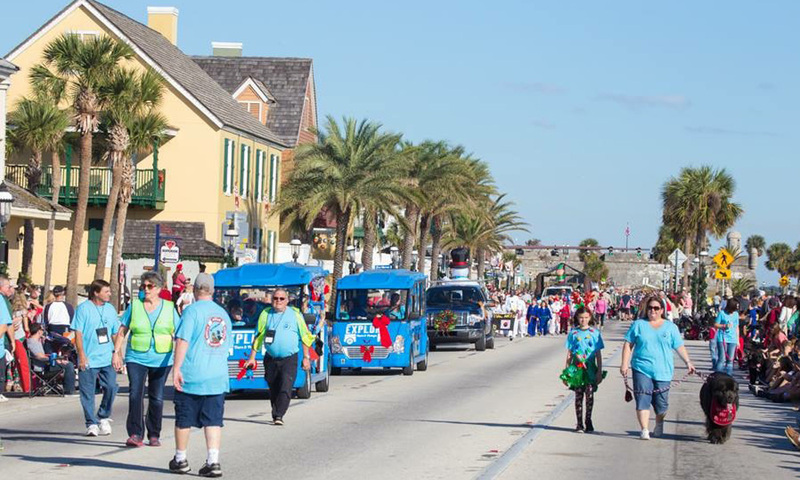 For a unique take on touring St. Augustine, Explore Tours and Pickups offers private tours and rides for up to 10 passengers. Whether a group is looking for an extensive and educational tour of the city's historic sites, or just a quick ride from point A to point B, Explore Tours and Pickups has transportation options to fit different needs and budgets. 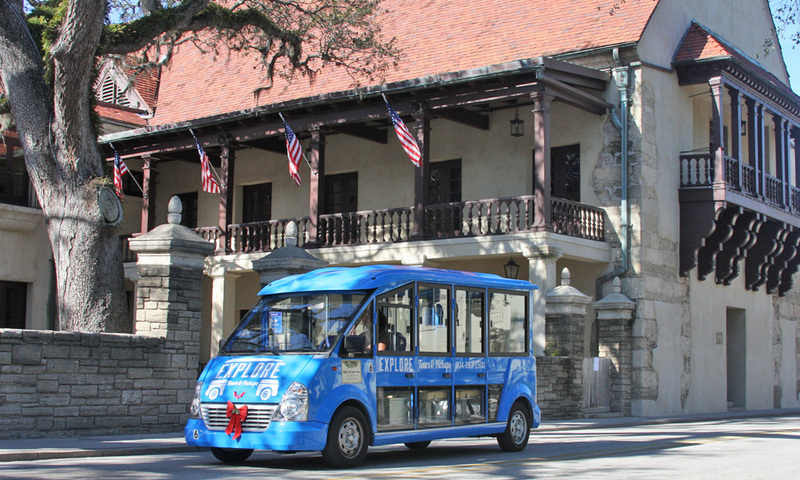 Owned and operated by St. Augustine locals, Explore Tours and Pickups offer an insider perspective in this historic city. With options starting as little as $4 per person (one-way), Explore Tours and Pickups provides rides in special electrical vehicles that can accommodate up to 10 guests, perfect for visitors who want to get from one end of town to the other quickly. This tour service is also pet-friendly, so every member of your family may ride along. Tours and pick-ups may be booked in advance -- perfect for scheduling for group tours or even special event uses, like transporting wedding guests from point A to point B. Explore Tours can help with transportation for a variety of special events, including weddings, business trips, family reunions, and other celebrations like bachelorette parties. For those who want to linger and learn more about the city, Explore Tours and Pickups' Electric Vehicle Tours start at $20 per person. Private tours for groups up to 10 start at $180. Private tours are available daily starting at 11 a.m. and may be booked in advance. These guided tours are a great way to see St. Augustine's beautiful historic architecture and learn more about the history that shaped the city. Explore Tours' knowledgable guides are happy to make stops along the tours for photos. Tours typically last 45 minutes. For visitors looking to take in the sights of St. Augustine's holiday Nights of Lights displays, Explore Tours offers special Nights of Lights tours through February 3, 2019. These 30-minute Nights of Lights tours are $20 per person and $15 per child under age 12. Private tours are available for $180. These special tours are available nightly. Nights of Lights tours will pick up from two locations (from the City Gates at 1 St. George Street and from the Casa Monica Resort & Spa at 95 Cordova Street). For more information, or to book a tour, please visit here. For more information about Explore Tours, please visit here, or call (904) 853-1500. Good night out on the town! My daughter and I wanted to see the lights in downtown St. Augustine and luckily I was paired up with Explore Tours and pickups! Calli, who was in the office was very helpful in making sure the tour guide knew where we wanted to go and gave us blankets for the ride since it was a tad chilly. Blaise, the tour guide was very knowledgable and even stopped the tour to make sure my daughter and I got our pictures taken with the lights! I Will definitely use Explore Tours and Pickups again, whether it's for a tour or just getting a quick ride from point A to point B. The service is great! Great to go back in time! Had a great time with my wife! Next time we will be bringing our friends with us.